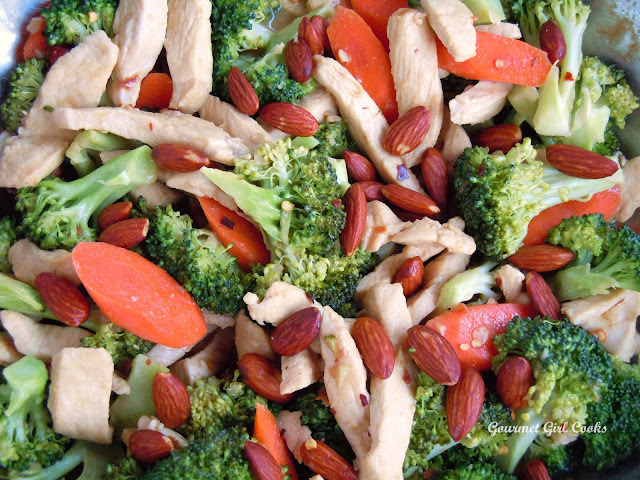 This evening I made a quick Chicken w/ Broccoli Stir-Fry and tossed in a few roasted whole almonds at the end for a little extra crunch. I snapped a quick picture below for you to see. This is very similar to the recipe I made for my Quick & Spicy Stir-Fried Chicken in this link, except in tonight's stir-fry I used cashew butter as my thickener (instead of peanut butter), used boneless chicken breasts (instead of chicken thighs) and topped it with almonds (instead of peanuts). I served mine over "cauliflower rice" and hubby had his over brown rice. It was quick, simple and delicious. Enjoy!